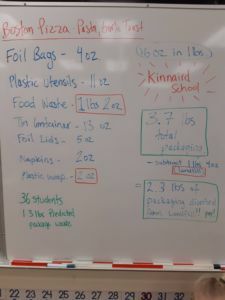 Kinnaird Elementary Eco Challenge results are in! Wow! 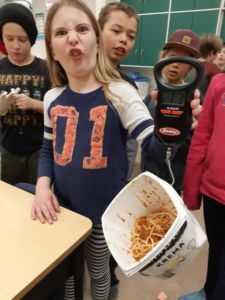 What a success this Hot Lunch Eco Challenge was. Let’s start with Ms. Powers Gr. 5 class from Kinnaird Elementary in Castlegar. There were 2 classes participating for a total of 36 students. Kinnaird’s Hot Lunch was from Boston Pizza. The students did a great job organizing and sorting all of this packaging material. Before recycling some material, they had to rinse foil trays and cutlery (trying of course to conserve water). Also, we determined there was a substantial amount of food waste that could not be composted. This led to some great discussions! Overall the students diverted 2 lbs. 3 oz of waste from the landfill. This Eco Challenge was amazing in gaining awareness in take-out food packaging and food waste. Perhaps these students can do a school wide Hot Lunch Challenge in the near future? Great job Kinnaird!